On the 19TH OF February 1851, Mother Gertrude O’Brien, Sr. M. de Pazzi, Sr. M. de Sales and Sr. M. Veronica came from Westport to Ballinrobe to start a new foundation. Very Rev. T.Hardiman then P.P. of Ballinrobe and Mother M. Paul Cullen (sister of Cardinal Cullen) Superior in Westport, accompanied them. Mother Paul remained in Ballinrobe until March 24th, when she returned to Westport. 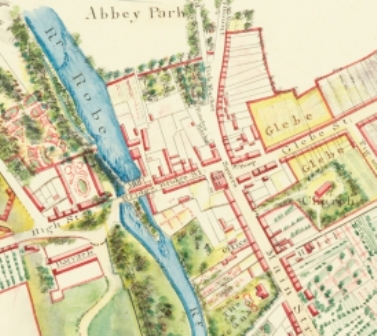 The people of the parish of Ballinrobe were very poor at this time, following the dreaded famine years and were unable to make adequate provision for the foundation. His Grace, Most Rev. 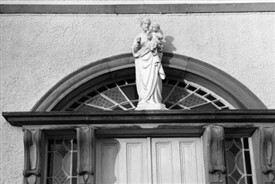 Dr. Mc Hale gave very considerable financial aid Mr. Blake, a Solicitor, vacated his house in Main Street, (site of the present Catholic Repository opposite the main gates to St. Mary’s RC) to provide the sisters with shelter and this dwelling was furnished as a temporary convent dedicated to St. Joseph. Here the Sisters lived until 1853. A school was opened in the yard of the house vacated by Mr. Blake. The Archbishop was unwilling to have them connected with the National School Board and on that account, the Sisters had no Government assistance, His Grace, the priests and people of the parish (as well as they could afford) helped to supply their urgent needs. On March 26th 1851 Sr. M. Aloysius Mc Neave, the first postulant was received in a public ceremony which took place in the Parish Church, then situated on Chapel Road. On the 20th of February 1852 another postulant entered Sr. Patrick Waldron. She was destined later to be the first Superior of the Sisters of Mercy in Philadelphia. By 1853 steps were taken to secure a site for a Convent. A field was rented from Colonel Knox and here the construction of the present Convent was commenced. The Sisters took up residence in their new home in 1854. Classes were now organised more fully and a Sunday School for adults were started. In 1861 the funds of the Convent were very low, and the Superior Mother M. Gertrude opened a boarding school for young girls. Bazaars became a yearly event and by the present day standards realised substantial sums £130. During 1862 the Sisters were requested by the Authorities to assist in the Workhouse Hospital and four Sisters took up duty there. Dr. Mc Hale died in 1881 and was succeeded by Dr. Mc Evilly as Archbishop of Tuam. In the following year the schools were connected with the National Board and the building of a new National School was commenced in 1899. In 1918 a Secondary School was opened at the request of Canon D’Alton and within a short time there were sixty pupils enrolled. Later a Commercial School was opened and pupils were prepared for secretarial and other posts. In 1921 a Silver cup was offered by Dail Fireann to the Intermediate School which excelled in Oral Irish and the pupils of the Sacred Heart School were awarded the highest marks. The coveted “Corn na Dala” was presented by Mr. Francis Fahy T.D. Branch Houses were established at Clonbur and Lecanvey in 1924 and 1925 respectively, and four Sisters were assigned to each house. They took over the running of Primary Schools in both places. The Centenary of the foundation of the Convent of Ballinrobe was celebrated in Faster Week 1951. To mark the occasion Solemn High Mass was celebrated in the Parish Church at which His Grace, Most Rev. Dr. Walsh Archbishop of Tuam presided. “The Message of Fatima” was presented in the Town Hall. On April 22nd 1956 Very Rev. T. Gunnigan P.P. formally opened and blessed a new Secondary School which had been erected by Messrs. Cox. Westport. At present this building is being extended and it is hoped that it will be completed by next Sept. a new Primary School is also under construction. While the building may display more modern architecture than the first once, which houses our pupils in Mr. Blake’s yard we hope to bring to our work the same devotion and dedication that inspired those first Sisters of Mercy.